McLennan Co. 9-1-1 Emergency Assistance District is also known as McLennan County 9-1-1, MCEAD or the District. While the District is not a part of the county government, MCEAD serves the citizens of McLennan County as a political subdivision of the State of Texas. The MCEAD visits local schools and groups to spread the educational efforts of 9-1-1. Schedule your visit today and Cell Phone Sally will come to your school! The District provides physical addresses for unincorporated areas of McLennan County. Click on the button below to request an address. Text to 9-1-1 service is available in McLennan County. Wireless carriers in McLennan County have implemented the service and their customers can now send a text message to 9-1-1 in an emergency. 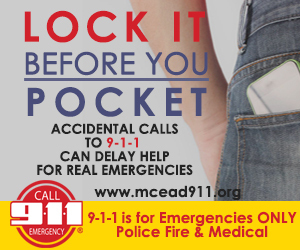 Accidental 9-1-1 calls, also known as pocket dials, delay help for emergencies so remember to "Lock it before you Pocket."